Magnetic accessories for use with our OptiMA Graphic custom printed dry erase boards, grid boards and dry erase calendars. These are awesome magnetic accessories that you will find extremely useful with your new magnetic dry erase boards. Why rewrite everything when you can simply move a magnet instead. 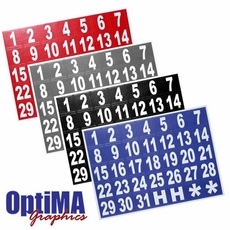 We offer OptiMA Graphic colored magnetic number sets and months of the year in addition to data cards and colored magnetic write on / wipe off ribbons and strips. Don't forget the damp erase markers. They are so much better to use than a dry erase marker when you're writing on a planning or scheduling board. 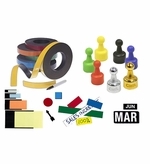 A set of 4 assorted color chisel tip dry erase markers and a cloth for cleaning your boards. 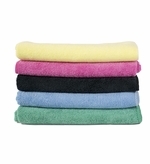 16" x 16" Dry Erase Cleaning Cloths in Black, Blue, Green, Yellow and Pink. Clean your board better than ever before. 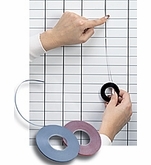 Create your own lines on dry erase boards with colored vinyl tapes. Three different widths and five colors available. From "Available Sizes" "2: 1/16\" Wide x 648\" Long (+$7.50)" "4: 1/8\" Wide x 324\" Long (+$7.95)" "8: 1/4\" Wide x 324\" Long (+$8.95)" "Select Color" "BLK: Black" "YEL: Yellow" "RED: Red" "BLU: Blue" "GRN: Green"
5" x 10" Microfiber eraser mitts clean your boards much better than standard felt erasers and you can't drop it either.